Help your employees to excel in dealing with the public with this stimulating, fun-filled collection of customer service training games. Designed not only to teach important skills but also to spark enthusiasm and a high level of involvement in the participants, these games utilize entertaining and instructive techniques such as role-playing, charades, brainstorming, and debate. As a result of these exercises, employees will learn how to create a rapport with the customer, how to focus on the unique needs of individual customers, how to maintain a positive attitude, and more. - Publisher Supervisors and trainers: turn your customer service reps into your company's biggest asset! Because they're out there dealing with the public, frontline workers such as customer service representatives, salespeople, and technicians have the capacity to make a company look very bad...or very good. With the help of this creative collection of training games, you can be sure that your employees can be counted on to give your company a good reputation--employees who...know how to create a rapport with the customer or client; recognize and respond for the needs of every customer; go beyond the expected; bring enthusiasm and a love of what they do to the job. These easy-to-use games take just 15-30 minutes and include reproducible handouts and worksheets. You can use them either to enliven traditional customer service training programs or to add a training component to a regular staff meeting. Customer service training games will help your frontline service workers keep a positive attitude at all times; speak and communicate clearly, both on the telephone and face-to-face; deal with difficult customers, and much more. 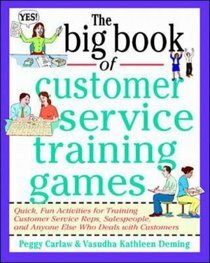 About "The Big Book of Customer Service Training Games"
Supervisors and trainers: turn your customer service reps into your company's biggest asset! Because they're out there dealing with the public, frontline workers such as customer service representatives, salespeople, and technicians have the capacity to make a company look very bad...or very good. With the help of this creative collection of training games, you can be sure that your employees can be counted on to give your company a good reputation--employees who...know how to create a rapport with the customer or client; recognize and respond for the needs of every customer; go beyond the expected; bring enthusiasm and a love of what they do to the job. These easy-to-use games take just 15-30 minutes and include reproducible handouts and worksheets. You can use them either to enliven traditional customer service training programs or to add a training component to a regular staff meeting. Customer service training games will help your frontline service workers keep a positive attitude at all times; speak and communicate clearly, both on the telephone and face-to-face; deal with difficult customers, and much more. Peggy Carlaw is the founder and president of Impact Learning Systems International, a training and consulting company based in California. Vasudha Kathleen Deming is an instructional designer and training consultant specializing in customer service and technical support.